Oilfield-service providers, happy to close the book on a largely unforgiving 2017, are eyeing a rebirth with higher crude prices sowing the seeds for a prolonged period of growth. Last year wasn’t kind to these companies. The Philadelphia Oil Services Index lost 17 percent, ending 2017 at its lowest yearly level since 2008. The first hints of a shift could come Friday, when Schlumberger Ltd. may report adding more than $1 billion in sales in the fourth quarter, compared with a year earlier, according to an average of 33 analyst estimates. A range of services and equipment in a variety of global markets are set for added activity and price hikes this year, analysts at Tudor Pickering Holt & Co. said this week. While they don’t see quarterly results blowing away estimates, they urge investors to take a long view on the stocks. Already, the shares of Schlumberger and Baker Hughes, two of the biggest contractors, are leading the Standard & Poor’s 500 Energy Index. Oilfield-service providers, hired by oil explorers to do everything from mapping prospects to maximizing field output, were the first to get clobbered when the worst crude-market crash in a generation kicked off in 2014. They accounted for the largest chunk of job cuts that cast hundreds of thousands out of work and incurred massive financial losses. Last year, as crude prices began rising, there was renewed hope they would gain as a result. But customer demand returned so fast that service providers were caught off guard and chewed up most of their profits putting workers and gear back into the fields. All that was compounded by more prudent second-half spending from explorers, at the behest of returns-hungry investors. Now it appears a shift may be finally at hand. Since hitting a low of $60.83 a share on Nov. 16, Houston- and Paris-based Schlumberger rose 28 percent in New York trading to a high of $77.97 on Jan. 12. While that’s still short of the $84.98 level recorded in January a year earlier, it’s headed in the right direction. International activity by drillers is expected to rise about 7 percent in 2018, Charles Minervino, an analyst at Susquehanna Financial Group, said in a Jan. 5 note to investors. If so, it could be a significant spur for Schlumberger, a company with about 70 percent of its sales generated outside the U.S. and Canada. The region that includes Europe, Africa and the former Soviet Union is expected to see the biggest international growth for both Schlumberger and Halliburton this year, Dan Boyd, an analyst at BMO Capital Markets, wrote this week in a note to investors. Second for both companies will be Latin America. The North Sea is expected to show a higher rate of growth this year, thanks in part to Statoil ASA’s projects that include Snorre and Castberg, Boyd wrote. Latin America growth is projected to come from Argentina, Columbia and Guyana, where Exxon Mobil Corp. has reported findings that may hold the equivalent of 3.2 billion barrels of oil. In Brazil, Petrobras is scheduled to start up eight vessels for handling production, storage and the offloading of oil, up from two last year. Last month, Patrick Schorn, Schlumberger’s executive vice president for new ventures, told investors in New York that the company is turning increasingly positive on the overall outlook for its global business. “We do expect activity tailwinds in a number of regions around the world in 2018,” he said. While Schlumberger is the first servicer to report fourth-quarter earnings, Halliburton Co., the top provider of fracking equipment and workers, is expected to have plenty to tell investors about the future of the U.S. shale boom when it reports on Jan. 22. Shale explorers have been facing investor demands for increased returns over new growth as oil prices have risen. 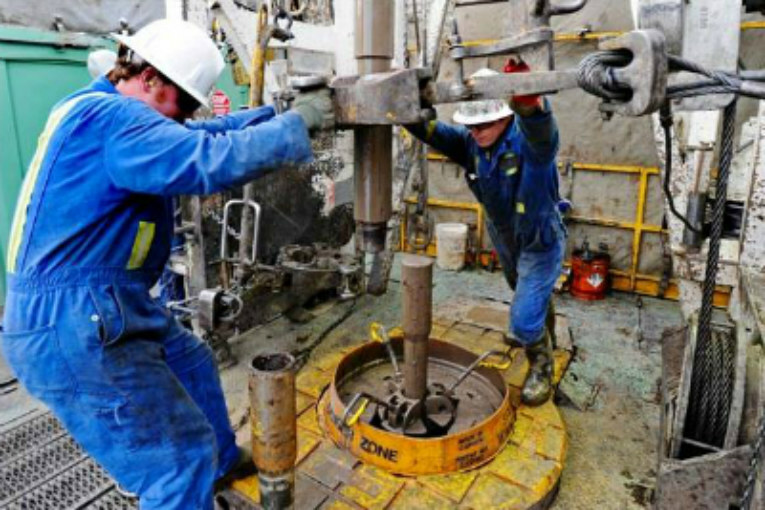 One result of that may be a push by drillers to finally open a record backlog of wells in America’s premier shale fields that have been drilled but aren’t yet in service. That goes to Halliburton’s strength. As with Schlumberger, Halliburton’s shares have been on the rise, gaining 30 percent in New York trading between Nov. 28 and Jan. 11. When it releases financial results on Jan. 22, the Houston-based servicer is expected to report a profit of 47 cents a share, excluding certain items, according to the average of 31 analysts’ estimates compiled by Bloomberg. That’s up from 4 cents a year earlier. Exploration and production companies are expected to boost spending 20 percent in North America this year, with more of that going to fracking over drilling, according to Susquehanna’s Minervino.